Sign the CLA by logging in at https://projects.eclipse.org/user/login/sso (You only need to do this once). If you are using Gerrit version 2.13.8 or later, you may encounter an error : Failure to obtain Gerrit configuration this is due to Gerrit 2.13.8 has not been tested with this version of Mylyn. It may not be fully supported. In this case go to Option B Import using Git Repository window. Otherwise continue here with Option A Import using Task Repository. - Option A := Import using Task Repository. Or, try the new Gerrit Dashboard! - Option B := Import using Git Repository window. 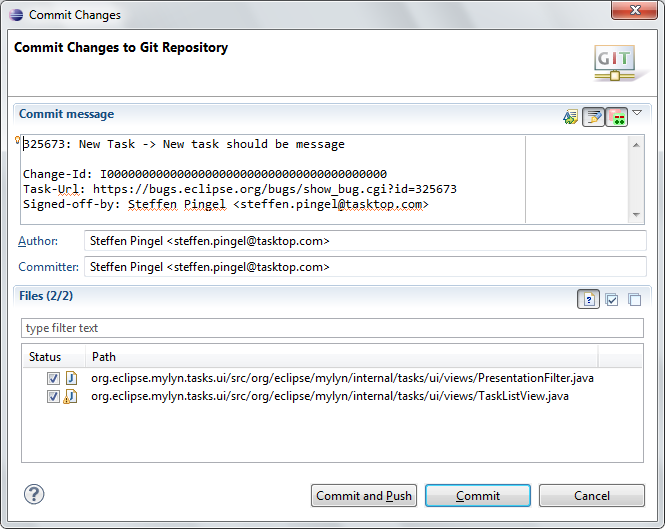 Git Repositories window, right click Repository, click Properties. Under Configuration tab, look for remote > origin > url. The best thing about the Gerrit based reviews process is that it means that all code gets reviewed in the same way, regardless of who wrote it. The only significant differences between contributors and committers are that only committers can approve commits (vote +2) and single contributions of over a 1,000 lines of code must go through extra IP process. (Another reason to keep those commits small.) So even if you never decide to become a Mylyn committer you can still make significant improvements to Mylyn! The Eclipse Genie will automatically a comment on the original bug with a link to the review (assuming your commit message was formatted correctly). Be patient and prepared to iterate. While some simple changes might get committed in a day or two, complex changes requiring input from contributors might require refinement over a few weeks. The Gerrit tools make this process much less painful then before. When you push a patch set to a review, Hudson will automatically start a build that checks out your patch set and runs tests. If you are not a committer or a whitelisted contributor, the build will be aborted with a message in the console output similar to "Gerrit build started by unauthorized user jane.user. Committers, verify that the change is safe to run and then retrigger the build." In that case you'll need to wait for a committer or a whitelisted contributor to retrigger the build. Click "Commit". You can do a "commit and push" directly, but at least until you gain some experience it's probably a good idea to double-check your commit before pushing it. Is everything that you expected to be there there? Does the commit message match the example below? Mylyn is built regularly by jobs running on the Mylyn HIPP server. See Mylyn/Build_Infrastructure for details. Gerrit jobs are triggered when a patch set is pushed to Gerrit. In order to protect against unauthorized users pushing malicious code to Gerrit and having it automatically executed by the gerrit-trigger plugin, these builds will be automatically aborted if the patch set submitter is not a committer on the project, and is not on a project-specific whitelist. In that case, a committer or someone on the whitelist will need to review the contribution to ensure it does not attempt to run malicious code. They can then retrigger the aborted build and it will run normally. The whitelist is defined at /shared/gerrit-contributor-whitelists/mylyn/org.eclipse.mylyn/contributor_whitelist.txt. Any committer should have write access to the whitelist and should feel free to add the emails of trusted contributors to the list. Shell access to build.eclipse.org can be requested via Bugzilla. Alternatively, you can email mylyn-dev to ask another committer to edit the whitelist. You can use the Oomph installer to setup the Eclipse installation and everything required to get started with Mylyn development. It downloads Eclipse, sets the API baseline, clones the Mylyn git repo and imports the projects for you. You can set the Target Platform from Galileo - 3.5 up to the actual version. Start the installer using the oomph executable. At the package selection, click the preference button in the top-right corner and select the Advanced Mode button. If you are behind a proxy, at this point you might want to double check your network settings by clicking in the "Network Proxy Settings" at the bottom. Select Eclipse IDE for Eclipse Committers. Click next. Under Eclipse.org, double-click on the Mylyn components you want to use. The components have three subentries; if you select one of the subentries you do not need to select the parent folder to get the source. When you have selected your entries click finish. After the initial setup, you should have a complete Eclipse environment to work on Mylyn and you can do the following optional steps to finish setup. The bundle.tests bundles (e.g. org.eclipse.mylyn.tasks.core.tests) are unit tests; the bundles are fragments to enable unit testing with package private access. The component.tests bundles (e.g. org.eclipse.mylyn.tasks.tests) are integration tests that run against the API. This page was last modified 12:53, 17 November 2017 by Declan OBrien. Based on work by Jonathan Gossage, Frank Becker and Sam Davis and others.